Sagebrush, undoubtedly whispering to itself. 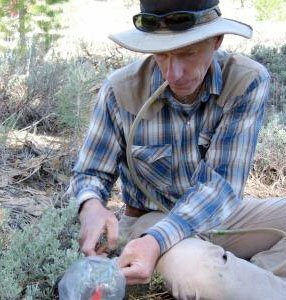 UC Davis researcher Richard Karban has worked on sagebrush communication at Sagehen since the early 2000’s. Among other startling revelations, his work suggests that plants have self-recognition, the first step required for several things we typically associate with higher animals; like immune systems and kin selection, for instance. Rick and his team continue to publish ground-breaking research, and a recent University of Chicago Press book, Plant Sensing and Communication, that is hailed as the new standard in its field. Karban scored a coup that eluded us when he brought Michael Pollan to Sagehen to research an article that appeared in the New Yorker, Christmas 2013. How To Do Ecology, Karban’s popular press book is now in its second edition. Plant Communication from F. Felix on Vimeo. Arimura, Gen-ichiro, Kaori Shiojiri, and Richard Karban. “Acquired Immunity to Herbivory and Allelopathy Caused by Airborne Plant Emissions.” Phytochemistry 71, no. 14–15 (October 2010): 1642–49. https://doi.org/10.1016/j.phytochem.2010.06.021. Eaton, K. M., and R. Karban. “Effects of Trichomes on the Behavior and Distribution of Platyprepia Virginalis Caterpillars.” Entomologia Experimentalis et Applicata 151 (2014): 144–51. Grof-Tisza, P., M. Holyoak, E. Antell, and R. Karban. “Predation and Associational Refuge Drive Ontogenetic Niche Shifts in an Arctiid Caterpillar.” Ecology 96 (2015): 80–89. Grof-Tisza, P., E. Lopresti, S. Heath, and R. Karban. “Plant Structural Complexity and Mechanical Defenses Mediate Predator-Prey Interactions in an Odonate-Bird System.” Ecology and Evolution 2017, no. ece3.2705 (2017). Grof-Tisza, P., Z. Steel, and R. Karban. “The Spatial Distribution and Oviposition Preference of the Ranchman’s Tiger Moth, Platyprepia Virginalis (Lepidoptera: Erebidae).” Journal of the Lepidopterist’s Society 71 (2017): 16–19. Heil, Martin, and Richard Karban. “Explaining Evolution of Plant Communication by Airborne Signals.” Trends in Ecology & Evolution 25, no. 3 (March 2010): 137–44. https://doi.org/10.1016/j.tree.2009.09.010. Hughes, K. M., I. S. Pearse, P. Grof-Tisza, and R. Karban. “Individual-Level Differences in Generalist Caterpillar Responses to a Plant-Plant Cue.” Ecological Entomology 40 (2015): 612–19. Ishizaki, S., S. Kubota, R. Karban, and M. Ohara. “Development of Eight Microsatellite Markers in Big Sagebrush (Artemisia Tridentata Nutt. ).” Molecular Ecology Resources, 2009. Ishizaki, Satomi, Kaori Shiojiri, Richard Karban, and Masashi Ohara. “Clonal Growth of Sagebrush (Artemisia Tridentata) (Asteraceae) and Its Relationship to Volatile Communication.” Plant Species Biology 27, no. 1 (May 29, 2011): 69–76. https://doi.org/10.1111/j.1442-1984.2011.00333.x. ———. “Seasonal Variation of Responses to Herbivory and Volatile Communication in Sagebrush (Artemisia Tridentata) (Asteraceae).” Journal of Plant Research, April 2016, 1–8. https://doi.org/10.1007/s10265-016-0818-z. Karban, R. “Associational Resistance for Mule’s Ears with Sagebrush Neighbors.” Plant Ecology 83(2), 2007 (2007): 295–303. ———. “Damage to Sagebrush Attracts Predators but This Does Not Reduce Herbivory.” Entomologia Experimentalis et Applicata 125(1):71-80 (2007). http://www3.interscience.wiley.com/journal/117984842/abstract. ———. “Damage-Induced Resistance in Sagebrush: Volatiles Are Key to Intra- and Interplant Communication.” Ecology 87(4), 2006pp. 922‚Äì930 (2006). https://sagehen.ucnrs.org/pubs/2006/Karban-Ecology06.pdf. ———. “Experimental Clipping of Sagebrush Inhibits Seed Germination of Neighbours.” Ecology Letters 10(9):791-797 (2007). http://www3.interscience.wiley.com/journal/118545878/abstract. ———. “Leaf Drop in Evergreen Ceanothus Velutinus as a Means of Reducing Herbivory.” Ecology 89, no. 9 (2008): 2446–52. ———. “Plant Communication Increases Heterogeneity in Plant Phenotypes and Herbivore Movement. 31:990-991.” Functional Ecology 31 (2017): 990–91. ———. “The Language of Plant Communication (and How It Compares to Animal Communication).” In M. Gagliano, J. Ryan, P. Vieira (Eds.) The Language of Plants, 3–26. University of Minnesota Press, 2017. ———. “Tradeoff between Resistance Induced by Volatile Communication and Over-Topping Vertical Growth.” Plant Signaling and Behavior 12, no. e1309491 (2017). ———. “Transient Habitats Limit Development Time for Periodical Cicadas.” Ecology 95 (2014): 3–8. Karban, R., P. Grof-Tisza, and J. D. Blande. “Chemotypic Variation in Volatiles and Herbivory for Sagebrush. 42:829-840.” Journal of Chemical Ecology 42 (2016): 829–40. Karban, R., P. Grof-Tisza, and M. Holyoak. “Wet Years Have More Caterpillars: Interacting Roles of Plant Litter and Predation by Ants.” Ecology 98 (2017): 2370–78. Karban, R., P. Grof-Tisza, M. McMunn, H. Kharouba, and M. Huntzinger. “Caterpillars Escape Predation in Habitat and Thermal Refuges.” Ecological Entomology 40 (2015): 725–31. Karban, R., M. Huntzinger, and I. S. Pearse. How to Do Ecology. 2nd ed. Princeton, NJ: Princeton University Press, 2014. Karban, R., S. Ishizaki, and K. Shiojiri. “Long‐term Demographic Consequences of Eavesdropping for Sagebrush.” Journal of Ecology 100, no. 4 (2012): 932–38. Karban, R., T. M. Mata, P. Grof-Tisza, G. Crutzinger, and M. Holyoak. “Non-Trophic Effects of Litter Reduce Ant Predation and Determine Caterpillar Survival and Distribution.” Oikos 122 (2013): 1362–70. Karban, R., J. L. Orrock, E. L. Preisser, and A. Sih. “A Comparison of Plants and Animals in Their Responses to Risk of Consumption. 32:1-8.” Current Opinion in Plant Biology 32 (2016): 1–8. Karban, Richard. “Neighbors Affect Resistance to Herbivory – a New Mechanism.” New Phytologist 186, no. 3 (May 2010): 564–66. https://doi.org/10.1111/j.1469-8137.2010.03263.x. ———. Plant Sensing and Communication. Chicago: University Of Chicago Press, 2015. ———. “Plant Variation: Its Effects on Populations of Herbivorous Insects.” In Plant Resistance to Herbivores and Pathogens: Ecology, Evolution, and Genetics. University Of Chicago Press, 1992. http://www.amazon.com/gp/product/0226265544. ———. “The Ecology and Evolution of Induced Resistance against Herbivores.” Functional Ecology 25, no. 2 (October 7, 2010): 339–47. https://doi.org/10.1111/j.1365-2435.2010.01789.x. Karban, Richard, and Ian T. Baldwin. Induced Responses to Herbivory. University of Chicago Press, 1997. Karban, Richard, and I.T. Balwin. “Induced Responses to Herbivory by R. Karban and I.T. Baldwin.” Trends in Ecology & Evolution 13, no. 2 (February 1998): 83. Karban, Richard, Patrick Grof-Tisza, and James D. Blande. “CHEMOTYPIC Variation in Volatiles and Herbivory for Sagebrush.” Journal of Chemical Ecology, August 15, 2016, 1–12. https://doi.org/10.1007/s10886-016-0741-8. Karban, Richard, Mikaela Huntzinger, and Ian S. Pearse. How to Do Ecology: A Concise Handbook. 1st ed. Princeton University Press, 2014. Karban, Richard, and Enrico Pezzola. “Effects of a Multi-Year Drought on a Drought-Adapted Shrub, Artemisia Tridentata.” Plant Ecology, February 9, 2017, 1–8. https://doi.org/10.1007/s11258-017-0710-5. Karban, Richard, and Kaori Shiojiri. “Identity Recognition and Plant Behavior.” Plant Signal Behavior 5, no. 7 (July 2010): 854–55. ———. “Self-Recognition Affects Plant Communication and Defense.” Ecology Letters 12, no. 6 (April 22, 2009): 502–6. Karban, Richard, Kaori Shiojiri, and Satomi Ishizaki. “An Air Transfer Experiment Confirms the Role of Volatile Cues in Communication between Plants.” The American Naturalist 176, no. 3 (2010): 381–84. https://doi.org/10.1086/655222. ———. “Plant Communication – Why Should Plants Emit Volatile Cues?” Journal of Plant Interactions 6, no. 2–3 (2011): 81–84. https://doi.org/10.1080/17429145.2010.536589. Karban, Richard, Kaori Shiojiri, Satomi Ishizaki, William C. Wetzel, and Richard Y. Evans. “Kin Recognition Affects Plant Communication and Defence.” Proceedings of the Royal Society of London B: Biological Sciences 280, no. 1756 (April 7, 2013): 20123062. https://doi.org/10.1098/rspb.2012.3062. Karban, Richard, William C. Wetzel, Kaori Shiojiri, Satomi Ishizaki, Santiago R. Ramirez, and Wallis Blande James D. “Deciphering the Language of Plant Communication: Volatile Chemotypes of Sagebrush.” New Phytologist 204, no. 2 (2014). https://doi.org/10.1111/nph.12887. Karban, Richard, William C. Wetzel, Kaori Shiojiri, Enrico Pezzola, and James D. Blande. “Geographic Dialects in Volatile Communication Between Sagebrush Individuals.” Ecology 97 (September 1, 2016): 2917–24. https://doi.org/10.1002/ecy.1573. Karban, Richard, L. H. Yang, and K. F. Edwards. “Volatile Communication between Plants That Affects Herbivory: A Meta-Analysis.” Ecology Letters 17 (2014): 44–52. Lopresti, E. F., P. Grof-Tisza, M. Robinson, J. Godfrey, and R. Karban. “Entrapped Sand as a Plant Defense: Effects on Herbivore Performance and Preference. 43:154-161.” Ecological Entomology 43 (2018): 154–61. Lopresti, E. F., R. Karban, M. Robinson, P. Grof-Tisza, and W. Wetzel. “The Natural History Supplement: Furthering Natural History amongst Ecologists and Evolutionary Biologists. 97(3):305-310.” Bulletin of the Ecological Society of America 97, no. 3 (2016): 305–10. Lopresti, E., and R. Karban. “Chewing Sandpaper: Grit, Plant Apparency and Plant Defense in Sand-Entrapping Plants.” Ecology 97 (2016): 826–33. Orrock, J. L., A. Sih, M. C. O. Ferrari, R. Karban, E. L. Preisser, M. J. Sheriff, and J. S. Thaler. “Error Management in Plant Allocation to Herbivore Defense.” Trends in Ecology and Evolution 30 (2015): 441–45. Pearse, Ian S., R. C. Cobb, and R. Karban. “The Phenology Substrate Match Hypothesis Explains Decomposition Rates of Evergreen and Deciduous Oak Trees.” Journal of Ecology 102 (2014): 28–35. Pearse, Ian S., D. Harris, R. Karban, and A. Sih. “Predicting Novel Herbivore-Plant Interactions.” Oikos 122 (n.d.): 1554–64. Pearse, Ian S., Kathy Hughes, Kaori Shiojiri, Satomi Ishizaki, and Richard Karban. “Interplant Volatile Signaling in Willows: Revisiting the Original Talking Trees.” Oecologia 172, no. 3 (April 11, 2013): 869–75. https://doi.org/10.1007/s00442-013-2610-2. Pearse, Ian S., and R. Karban. “Do Plant-Plant Signals Mediate Herbivory Consistently in Multiple Taxa and Ecological Contexts?” Journal of Plant Interactions 8 (2013): 203–6. ———. “Leaf Drop Affects Herbivory in Oaks.” Oecologia 173 (2013): 925–32. Pezzola, E., S. Mancuso, and R. Karban. “Precipitation Affects Plant Communication and Defense. 98:1693-1699.” Ecology 98 (2017): 1693–99. “Rick Karban’s New Book on Plant Communication: ‘Landmark in Its Field.’” ANR Blogs, July 22, 2015. http://ucanr.edu/blogs/blogcore/postdetail.cfm?postnum=18412. Savchenko, T., I. Pearse, L. Ignatia, R. Karban, and K. Dehesh. “Insect Herbivores Selectively Suppress the HPL Branch of the Oxylipin Pathway in Host Plants.” The Plant Journal 73 (2013): 653–62. Shiojiri, K., and R. Karban. “Plant Age, Communication, and Resistance to Herbivores: Young Sagebrush Plants Are Better Emitters and Receivers.” Oecologica 149(2):214-220 (2006). http://www.springerlink.com/content/7365760431151341/. ———. “Seasonality of Herbivory and Communication between Individuals of Sagebrush.” Arthropod-Plant Interactions 2(2):87-92 (2008). http://www.springerlink.com/content/5426g12232323018/. ———. “Vascular Systemic Induced Resistance For Artemisia Cana and Volatile Communication for Artemisia Douglasiana.” Am. Midland Naturalist 159(2):468‚Äì477 (2008). http://www.bioone.org/perlserv/?request=get-abstract&doi=10.1674/0003-0031(2008)159[468%3AVSIRFA]2.0.CO;2. Shiojiri, K., R. Karban, and S. Ishizaki. “Prolonged Exposure Is Required for Communication in Sagebrush.” Arthropod-Plant Interactions 6, no. 2 (2012): 197–202. Shiojiri, Kaori, Satomi Ishizaki, Rika Ozawa, and Richard Karban. “Airborne Signals of Communication in Sagebrush: A Pharmacological Approach.” Plant Signaling & Behavior 10, no. 12 (December 2, 2015): e1095416. https://doi.org/10.1080/15592324.2015.1095416. Shiojiri, Kaori, Richard Karban, and S. Ishizaki. “Volatile Communication among Sagebrush Branches Affects Herbivory: Timing of Active Cues.” Arthropod – Plant Interactions 3, no. 2 (2009): 99–104. https://doi.org/10.1007/s11829-009-9060-0. Shiojiri, Kaori, Richard Karban, and Satomi Ishizaki. “Plant Age, Seasonality, and Plant Communication in Sagebrush.” Journal of Plant Interactions 6, no. 2–3 (2011): 85–88. https://doi.org/10.1080/17429145.2010.545959. Summer Speaker Series #10: Plant Communication with Prof. Rick Karban, 2006. http://sagehen-video.blogspot.com/2006/08/summer-speaker-series-10-plant_17.html. Wetzel, W. C., H. M. Kharouba, M. Robinson, M. Holyoak, and R. Karban. “Variability in Plant Nutrients Reduces Insect Herbivore Performance.” Nature 539 (2016): 425–27.